The EU 15 - the 15 longest-standing members of the European Union - are not on track to meet their target reduction in greenhouse gases of 8% from the 1990 level required under the Kyoto Protocol with current measures, according to a report published this week by the European Environment Agency. According to the report, The European Environment: State and Outlooks 2005, given current trends and measures, the 15 will deliver a reduction in GHG emissions of 1.6% below the 1990 base year levels—a shortfall of 6.4%. The transportation sector, with an increase in greenhouse gas emissions of 24% from 1990 through 2003, is one of the leading impediments to achieving the target. The report concludes that the aggressive implementation of new measures could see a 6.8% reduction, still short of the 8% target. However, through reliance on Kyoto Protocol mechanisms like technology exchanges with developing countries and other multinational measures, EU-15 countries could reduce emissions by a further 2.5%, leading to total reductions of 9.3%, sufficient to reach the EU-15 target. This would, however, rely on over-delivery by some countries. In contrast to EU-15 countries, all EU-10 member states (the newest 10 members) project that existing domestic measures will be sufficient to meet their Kyoto targets in 2010. Total EU-15 GHG emissions in 2003 were 1.7% below base-year levels.. Increases in carbon dioxide emissions were offset by reductions in nitrous oxide, methane and fluorinated gas emissions. Carbon dioxide emissions from road transport increased whereas emissions from manufacturing industry decreased. 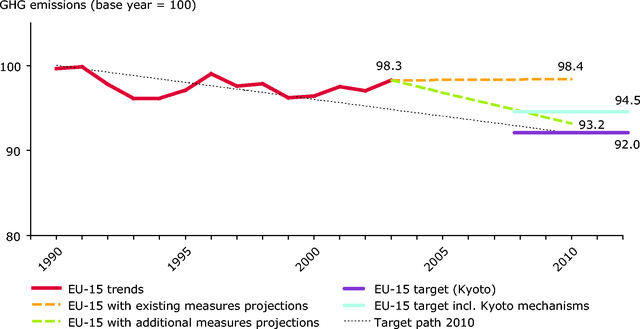 Total EU-15 GHG emissions (including Kyoto Protocol flexible mechanisms) in 2003 were 1.9 index points above the hypothetical linear EU target path. 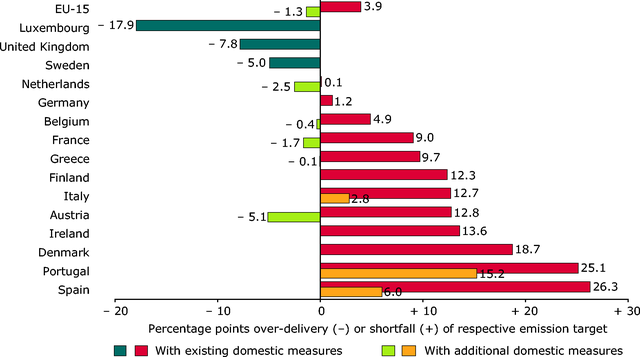 Many EU-15 Member States were not on track to meet their burden-sharing targets. 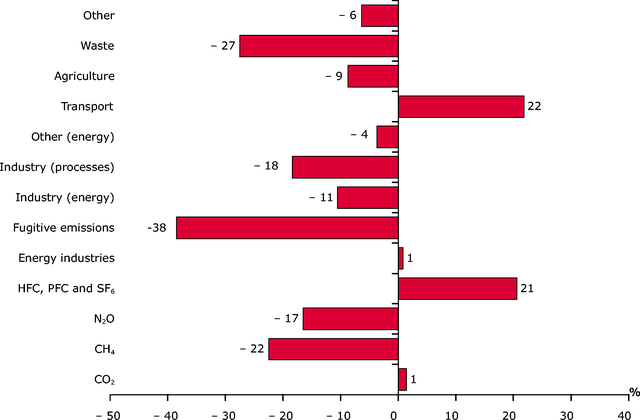 Total GHG emissions in the EU 10 decreased considerably (by 32.2%) between the aggregate base year and 2003, due mainly to the economic restructuring transition process towards market economies. Regarding other EEA countries, Iceland and the EU candidate countries Bulgaria and Romania are on track to achieving their Kyoto targets while Norway and Liechtenstein will, with existing domestic policies and measures, fall short of theirs. Graphic: relative gaps between GHG projections and 2010 targets, based on existing and additional domestic policies and measures, and changes by the use of Kyoto mechanisms. Graphic: change in EU-15 emissions of greenhouse gases by sector and gas 1990-2003. The EU-15 member states are: Austria, Belgium, Denmark, Finland, France, Germany, Greece, Ireland, Italy, Luxembourg, Netherlands, Portugal, Spain, Sweden and the UK. The EU-10 member states are: Cyprus, Czech Republic, Estonia, Hungary, Latvia, Lithuania, Malta, Poland, Slovakia, and Slovenia. The report also goes beyond climate change policy and examines the overall state of environemental quality in Europe. Other areas of concern the report raises include biodiversity, climate change, marine ecosystems, land and water resources, energy use, air pollution and health. The report's general conclusions are that "despite 25 years of Community environmental policy, environmental quality in the European Union (EU) was mixed and that the unsustainable development of some key economic sectors was the major barrier to further improvements." Obviously one key troublesome sector has been transportation and EU leaders will have to redouble their efforts to address this sector if they hope to achieve the environmental gains they have planned, including meeting Kyoto targets. According to Green Car Congress, for the first time, the report has a country by country analysis with performance indicators and comparisons for all of the participants: the EU-25 plus Bulgaria, Iceland, Liechtenstein, Norway, Romania, Turkey and Switzerland. I hope that this report will serve as a wakeup call to the leaders of the EU that they must redouble their efforts to reach their Kyoto targets. New serious and aggresive measures will be needed to impact the transport sector. As my girlfriend pointed out, this is likely the hardest sector for the governments of these countries to control. The other sectors where they have made gains - electricity generation and industry - have a significantly smaller number of actors to deal with and already have long traditions of governmental regulation. The personal driving habits of individual citizens are much harder to control although the cars they drive may not be as hard. This is also an interesting example (something to learn from) of how significantly transportation dominates our greenhouse gas emissions profile. In the United States, 1/3rd of all U.S. CO2 emissions amounting to more than 1.8 billion metric tons per year are emitted by the transportation sector. Efficiency gains can go a long way and the EU is far better off than the US in this regard but both need to focus on seriously increasing the efficiency of their transport fleet. However, efficiency can only go so far and the number of vehicle miles traveled (VMT) per year in both the EU and the U.S. are on the rise. This is very problematic if we want to curb CO2 emissions. Our efficiency gains would have to continuously outpace the increase in VMT each year which will likely be difficult. 2) Switch to a carbon-neutral fuel: this would allow us to continue increasing VMT without impacting the global climate. Now in order to truly be able to continue to increase VMT, this fuel would have to be renewable, available in ever increasing quantities and free of other impacts on the environment. Obviously finding such a fuel is difficult and whatever it may be, it will never be infinite. We will have to curb VMT eventually. This is one case where the maxim, 'there is no such thing as sustainable growth' is clearly true. However, there are alternative fuel options that could help. Coupled with fuel efficiency gains, less carbon intensive fuels like cellulosic ethanol or electric- or hydrogen-powered vehicles with energy from renewables like wind, solar and hydro could give us a pretty substaintial decrease in GHG emissions and a corresponding cusion to allow a (temporary!) continuation of the increase in VMT each year. Now a truly carbon neutral fuel may be out there too, in fact this may be it. Whatever way we tackle it, transport is the culprit and we have a long way to go to get it inline. Let's hope we can figure out how.